By all appearances, I was born healthy — a 9 lb., 14 oz., 21-inch-long baby girl. But appearances were deceiving. I had experienced a stroke in utero. For a time while I was growing up, this cost me the ability to use my right hand. With the help of an occupational therapist, family, friends, and the grace of God, I improved every day. But one question remained — Why me? Now I'm able to answer that. My stroke had a purpose — one that I found here at St. Scholastica. Even before this realization, my love for CSS was strong. It began when I was eight, as my family and I helped my older sister move into Somers Hall for her freshman year. Driving up College Street and seeing Tower Hall appear through the trees took my breath away. It was as cliché as it could get — a little girl falling in love at first sight at a castle — but it was at that moment I told myself that I would one day come here. And in my senior year of high school, as all of my friends toured college after college, I completed just one application — St. Scholastica's. As a stroke survivor, I have always felt that I was placed on this earth to share my story and reach out to others who went through similar experiences. With the motivation and support of my Dignitas class freshman year, I have found a way to do that, discovering my interest in neuroscience. I want to be able to help people with neurological defects reach their full potential — to pay my own experience forward by going into the field that has helped me live my life to the fullest from the beginning. To do this, I'm studying psychology, biology and gerontology. With this experience, and graduate school after it, I plan to work in a hospital or clinical setting alongside other neurologists and occupational therapists. There, I'll determine the most effective treatments for patients from all walks of life — both young and old — who have strokes, tumors and other brain-based illnesses and be by their sides every step of the way, cheering them on with an immense amount of support so they can become their very best. And that's exactly what the CSS community has been doing for me. To me, this is one of the best attributes of St. Scholastica. Everywhere you go on this campus, people believe in you. But that's far from the only reason I love it. I love this college because here I am acquiring the skills I need for my future endeavors. Here I met friends that I will have for a lifetime. Here the Benedictine Values of CSS — Love of Learning, Stewardship, Community, Respect, and Hospitality — have and will continue to inspire me to live a meaningful life every day. 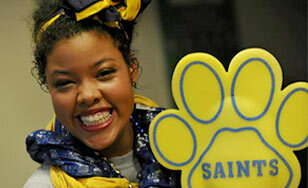 Here I bleed blue and gold in pride of being a Saint. Here I am not defined by my stroke. Rather, through perseverance, hard work, and the immense support of my family, friends, faculty and staff, I've been able to define myself. And, because of that, I feel truly blessed to call The College of St. Scholastica not only my school, but my home.